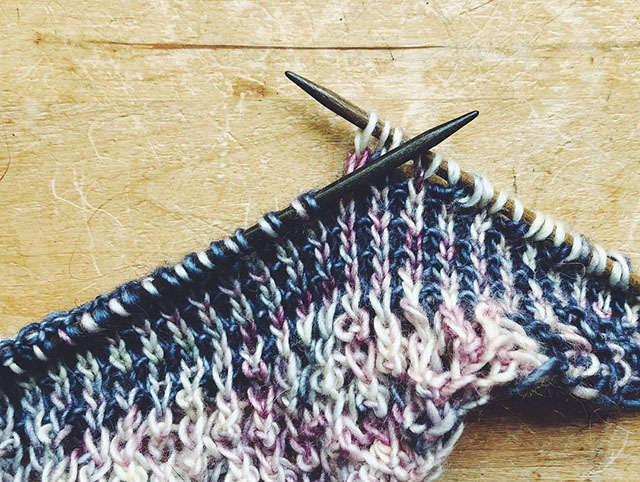 After a while, it gets hard to express how much I enjoyed a knit without sounding repetitious. I say a lot of the same things, especially if it's a favorite designer- and Libby Jonson is one of those. But, I don't want you to become desensitized to my exuberance about a project, because this was anything but run-of-the-mill. So I will get the usual, but very true, stuff out of the way: I did love it! I found it interesting, even challenging. 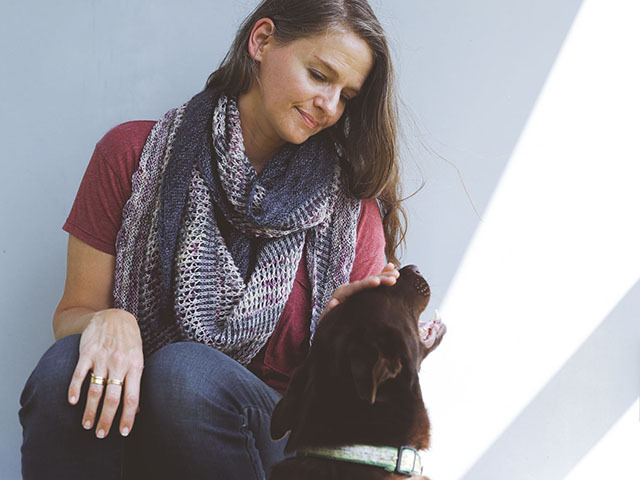 And I like to have at least one knit that requires some focus on me at all times. I also can't wait for the slightest breeze to throw this around my neck. Libby seems a little closer, not halfway around the world, as I knit on Zida. 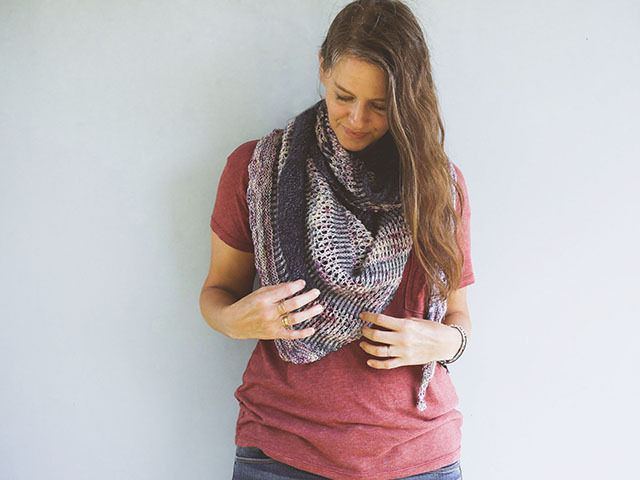 I feel like I know a designer a little better after knitting several of their patterns. It's like having a peek into their brain and seeing that it's your kind of place. And since you know you'll like all of their stuff, it starts to feel like every design is put out there just for you. I know, such ego. I took this to a few coffee dates and a couple of restaurants and enjoyed the soft clicking of my wooden needles as an accompaniment to our conversations. I wonder if my children will remember that sound, subconsciously, and if they hear it later. Will they be overcome with a sense of dejá vu, like when I smell lotion that makes me think of my mother's blue Deep Magic bottle. Deep Magic would be a great colorway name. The color I began with was Gentleman. 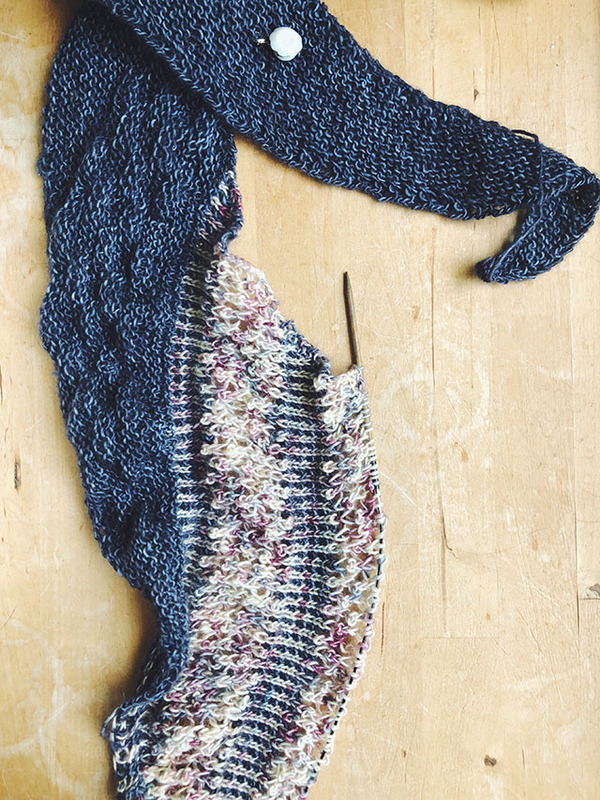 No matter how beautiful a solid is, I tend to be impatient to get to the variegated skein and I was impatient with this first garter section... until I hit the gathered bit. The gathered stitch was something new for me. There are a lot of things I haven't tried, but the list is shortening as the years go by. I always enjoy varying combinations of familiar stitches, but when I get to try a completely new one, that's special. 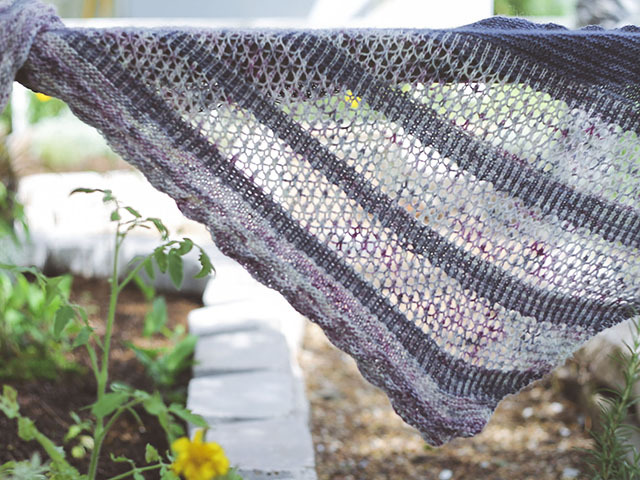 Suddenly Gentleman was hard to leave as I transitioned to the Soft Romance colorway for slip stitch. The slip stitch section is such a smart, graphic way to tie the lace to the garter. It was my favorite. Plus, stripes, you know? The fact that each of these striped little sections was small made it like a mini dessert. You know how restaurants serve those little mini desserts in cups and you order it all demure and seemingly moderate, but you really want a big hunk of chocolate mousse? It was like that. It drove my knitting and made me want to hurry to the next bit. 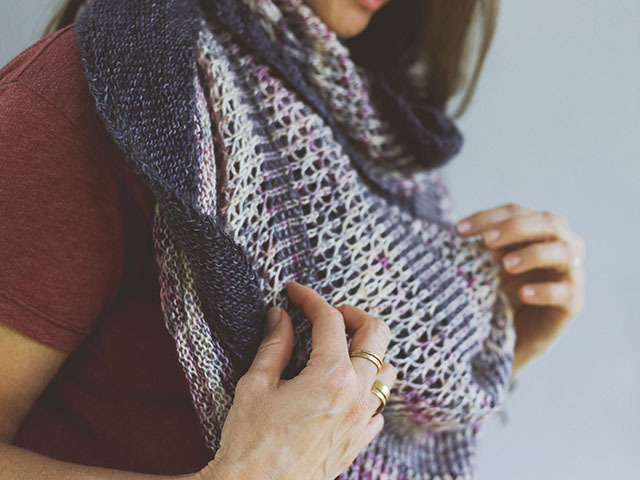 With slip stitch stacked on top of garter ridges, stacked on top of gathered welts and connected to variegated lacework- the whole thing feels like garment architecture. I think I am a texture person. 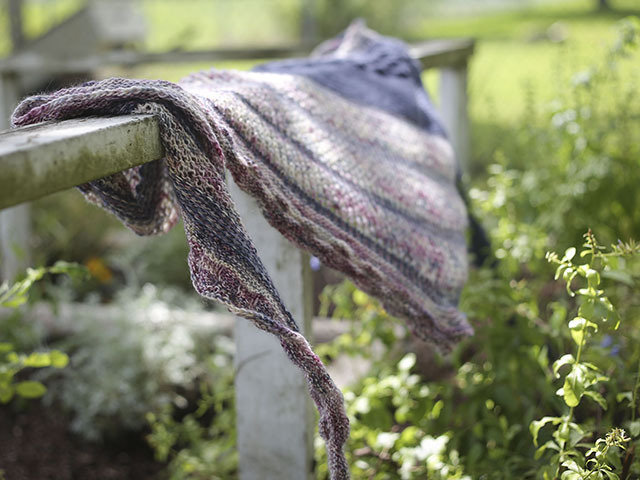 You know how everyone has a favorite element of knitting- color, shaping, intricate lace, etc. Well, mine must be texture and lines. That's why I loved the Rattan, Zelda, We were Seeds, and Marley so much. All have an element of texture and strong line (so Project Runway). 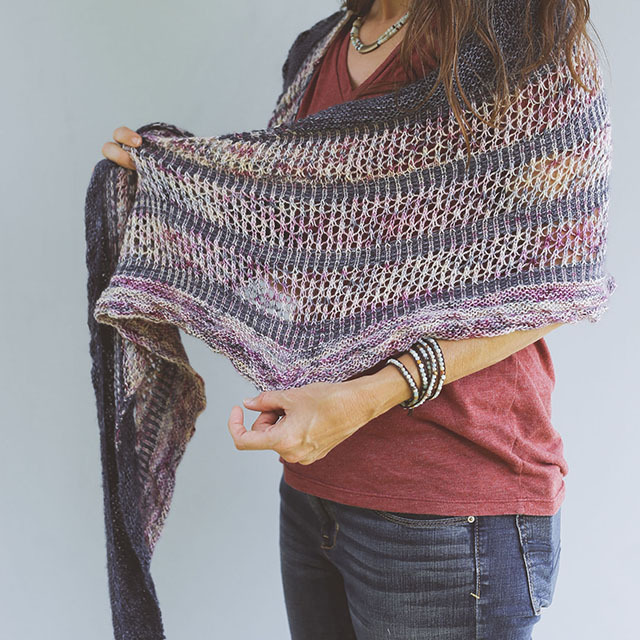 The thing is, I wouldn't expect a large, lace shawl to be so toned down by those elements, but I love that it is because I don't normally gravitate to lace. Then there was an aha moment with the slip stitch section when I knew I could do it without relying on my pattern so much. I love when that happens. I think I was re-watching Lost with my son when it happened. It was right when things on the island were getting intense, during season 1, so that's lucky. When I really "get" what I am knitting I feel like I accomplished something, even if the meat hasn't thawed by seven and if I have a dozen things still undone. It is something I can hold up to the family and say, "But look, I did this!" Of course, they're all looking down at devices, but I can say it all the same. Every time I think of these colors: Gentlemen and Soft Romance, I think of Scarlet and Rhett. Why? He was the best, but he wasn't really a gentleman and their romance was anything but delicate. Maybe it's just the fact that I hear them in a southern accent. I read Gone With the Wind the summer I graduated. Then I re-read it when my first child wouldn't nurse unless I was laying down (I know. Weird.) So I spent a lot of the first few months of her life laying down and I mowing through several good books like Imperial Woman. Gone With the Wind was the best of them, though. Then I read the sequel.. yuck. and a Margaret Mitchell biography...meh. 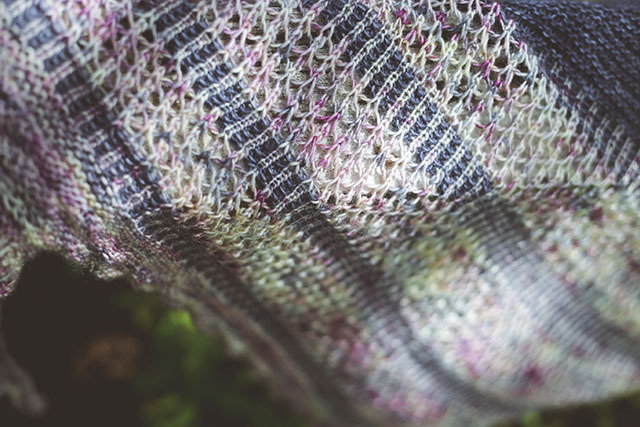 Details: I knit Zida with US size 4 needles, I think. 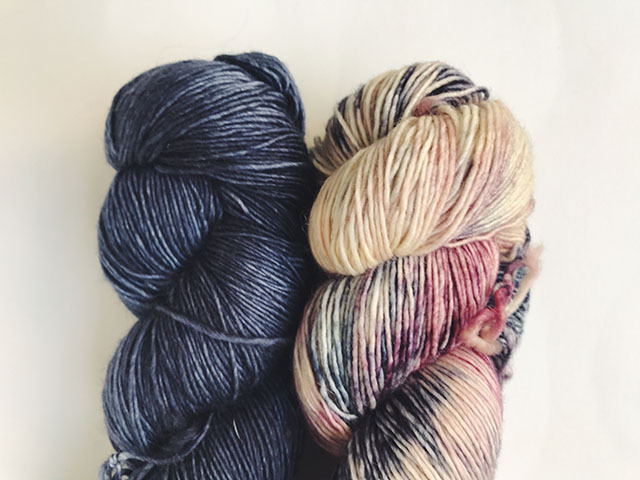 I used Red Sock Blue Sock Yarns' Singleton in the beautiful Gentleman and Soft Romance colorways, which seem made for each other and for me. That's that. I made no modifications, but I did find the edge of this shaw very forgiving as far as stitch count is concerned. If I was off by one stitch, once in a while, I would just fiddle with it to avoid having to rip back. I can't tell at all. Ramble's done. Have a lovely weekend, friends!! Honk if you like knitting.